To begin the quest, speak to Rantz. He wants help catching a chompy bird, so you'll offer to make him some 'stabbers' (these are just arrows). Just to the south of Rantz are some Achey trees. Get about 5 or 6 Achey logs and click them and pick the knife option on them to get ogre arrow shafts. 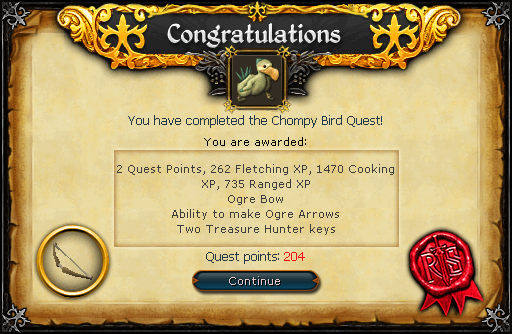 Use your feathers on the ogre shafts to get flighted ogre arrows. If you didn't bring the wolf bones, there are level 60 wolves to the southwest that you can kill to get them. Right click the bones and pick the craft option to get wolfbone arrowtips. Use the arrowtips on the flighted ogre arrows to create ogre arrows. Talk to Rantz again and he'll take 6 arrows for his own use. Make sure you talk to Rantz about all the options before continuing. Head north of Rantz and you'll find a cave. Enter the cave and you'll come across Rantz's children, Bugs and Fycie. They explain that they inflate toads with swamp gas using ogre bellows, which Rantz locked in a chest in the north west corner of the cave. The 'locked' chest is just a chest with a large rock on it. Attempt to unlock it. If you fail, your Strength level will be reduced by 1. When you unlock it, search it and you'll receive some ogre bellows. Now head out of the cave and back to Rantz. Turn south west and continue walking until you reach a swamp. Use the ogre bellows on a swamp bubble to fill it with swamp gas. 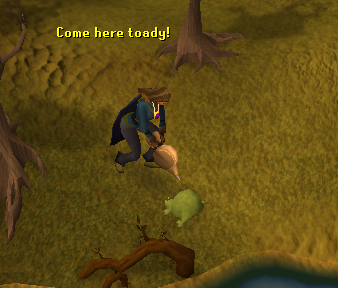 Then use the ogre bellows on a swamp toad to get a bloated toad in your inventory. Get three bloated toads before heading back to Rantz (you cannot hold more than 3 at one time). Rantz tells you to place the bait in a clearing just south of him. Drop the bloated toad under the arrow. Now move away from it, but keep it within sight. After a while, either it'll disappear or a chompy bird will come out. If necessary, place another bloated toad and wait for it to disappear. Do this again until a chompy appears. Rantz will attack it and miss, and blames it on your arrows. Ask him if you can try and get the chompy bird. He has his doubts but he'll give you his bow. Repeat the process until the chompy bird reappears. Kill it, pluck it and talk to Rantz. 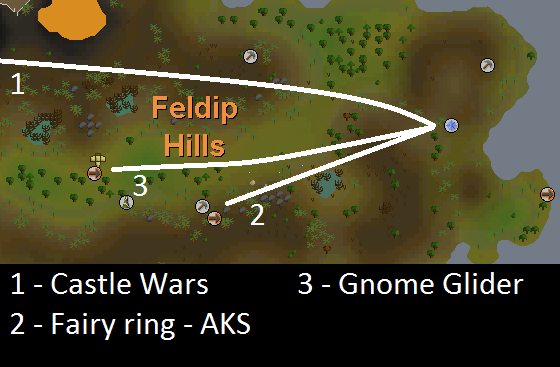 Once you have the ingredients, use the chompy on the spit just north of Rantz. Your character will add the ingredients and you'll get a cooked chompy, which you need to give to Rantz. He'll be very pleased with it, and quest complete!